More than three-quarters of Brits say they feel anxious that they’ll spoil their new clothes on the first wash, with more than half admitting that they no longer consider an item ‘new’ once it has been laundered. Three in five Brits say they purchase new clothes just for the ‘just bought feeling’, with many putting off putting new clothes through the wash because they are afraid their clothes won’t look the same as they did before washing. Some 40 per cent of Brits worry colours will bleed and whites will dull after the first wash. However, if they knew that they could clean their clothes like new in one wash, 60 per cent say it would remove the anxiety which they feel when washing their clothes that they’re going to get ruined. 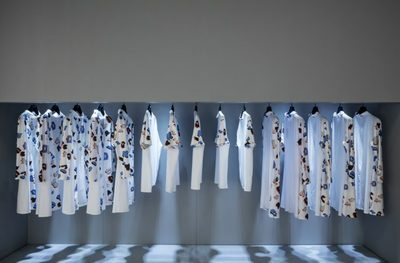 Leading Fabric Care brand Ariel has partnered with Designer Giles Deacon to conduct a Breakthrough Social Experiment to ‘redefine the meaning of clean’. Because the clothes looked beautifully new, unsuspecting shoppers did not realise that the seemingly new clothes had in fact been fully stained and then washed using Ariel 3 in 1 PODS! The experiment comes after research revealed three in five of us say that new clothes are important, with 79 per cent saying they give us a confidence boost when we need it the most. At Ariel, Fibre Scientists have identified ‘3 Signs of New’ where advanced performance can help consumers get a ‘clean like new’ look. These ‘3 Signs of New’ are stain free, bright colours and brilliant whites. The ‘Science Secret’ behind ‘Clean Like New’ is contained in Ariel 3 in 1 PODS which have an advanced cleaning formula which delivers a clean that goes beyond stain removal, using 3 step FibreScience to clean, protect and enhance your clothes.